A Haiti Democracy Project legislative delegation visited the White House and Congress on May 15, 2008 to urge the United States to use its good offices with President Préval to allow long-delayed elections to refill the depleted senate. Half of the delegation were women. The delegation consisted of three Haitian senators, two Haitian-American state legislators, and two Haitian-American election observers. The delegation was joined by a former U.S. ambassador. Full schedule. Sen. Evelyne B. Chéron, Lavalas senator from Department of the West, whose two-year term ended on May 8, 2008 but whose chances of reelection are good whenever elections are held. Amb. Vicki Huddleston, U.S. chargée d’affaires in Haiti, 1993–94. Gerald J. Gourdain, election observer for Haiti Democracy Project, 2006; member of board. Businessman, Beltsville, Md. The delegation was a follow-up to a Haiti Democracy Project delegation to Washington of five senators during October 1–3, 2007 which warned that the senate would lose a third of its membership without new elections and face the loss of a quorum, which would put the whole legislature out of business. In its meeting with four leading members of the Congressional Black Caucus, all with a strong legislative history toward Haiti, the delegation stressed the key role of governance in managing the hunger crisis. Two of the four members, Reps. Gregory W. Meeks and Sheila Jackson Lee, were headed to Haiti the next day on a trip to support those suffering from hunger. In the course of the discussion, Rep. John Conyers, chairman of the Judiciary Committee, expressed his and the caucus’s solidarity with the delegation’s impending visit to the National Security Council. At the National Security Council, Senator Beauzile noted that the delegation of five senators had raised the matter last October and had warned the president’s adviser and State Department that without vigorous U.S. action there would be no senatorial elections and the senate would lose a third of its membership, coming close to losing its quorum. Now, on May 15, 2008, there had been no elections and the senate had lost more than a third; it currently had eighteen of thirty, and the quorum was sixteen. With the kind of pressures that the senate was habitually subjected to, it could easily lose a quorum. She acknowledged that the United States and Canada had made their positions known after the delegation visited them in October, and that that initiative had brought temporary progress in the naming of an electoral commission and an able administrator in November and December. But that progress was quickly lost as regulations were revised to drain the administrator’s powers, and controversial changes were also made to the electoral law. Senator Boulos noted that the international community had made a highly significant investment, in the form of the U.N. mission and generous aid programs, to Haiti’s democratic recovery. Nevertheless, that did not change the fact that there was a driver at the wheel, and if that driver turned off the road he would take the international community and all its investments with him as well as the suffering Haitian people. The driver was veering off the road now with no corrective effort whatsoever by that community that had invested so much. He noted that Haiti’s rulers had an Epicurean taste for power: they enjoyed it, and they meant to keep it. Gerald Gourdain noted that as Haitian-Americans he and the legislators felt a kinship with their home country, but they were also U.S. taxpayers and it was U.S. tax money that was being wasted when expensive aid programs were allowed to fail because of unwillingness to correct ill-governance. Dan Fisk, assistant to the president for national security affairs in Latin America, said that he had come to listen to the Haitian legislators and hear their point of view. He noted a certain “disconnect” between the way the United States perceived its posture in Haiti and the way the senators depicted it. He had thought that the United States had made its positions clear; but he was open to hearing the senators’ suggestions. The United States might face certain constraints in the Haitian situation, Mr. Fisk noted. But nothing prevented it from expressing clearly the value of free elections and democratic institutions such as the parliament. Delegation organizer James Morrell noted that Senator Boulos had been freely elected as senator in 2006 by the people of the Nord-Est Department, but on March 18, 2008 had been forced to flee Haiti by a campaign mounted by President Préval. He considered that since the United States had done so much to make Haiti?s elections of 2006 possible, it had every right to ask why a duly-elected senator was being forced into exile. 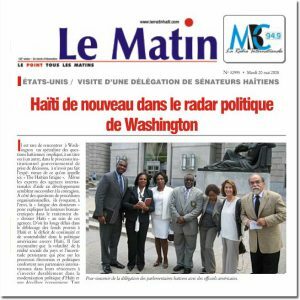 The visit of the Haitian and Haitian-American legislators came a month after food riots and in the wake of a Chamber of Deputies vote in Haiti against the choice of Ericq Pierre as new prime minister. (The senate had approved him.) Most of those voting against the nominee came from the president’s own party, suggesting a less than full commitment of the president to the nomination. The social unrest and the prospect of the Haitian state once again drifting without a constitutionally-named prime minister and cabinet, as it had done under Préval’s last presidency, made the delegation’s interlocutors more receptive to its warnings of misgovernance and the need for corrective action.